I'm a fan of pencils, so when the option to review the Manuscript Lettering Pencil set arose, my little paw was in the air. So, this is what it looks like: a plastic pack with a lead-holder, a sharpener and five colours of 'core' to slot into the holder. Inside the kit you get an instruction sheet on how to use the sharpener (like emery board) and two different kinds of lead core - for each colour, a round one like you'd find in any pencil and two squared off ones. Except for the graphite where you get an extra round core actually in the little lead holder when delivered. To change the leads out is very easy, just press that metal button on the end and the front of the pencil opens up like the front of a space ship! Spaceship opening - or just a vivid imagination? And you slide out the old lead and slot in the new one. I have had a rotten cold for a week *coughs pathetically, looking for sympathy* and so took myself out to the shed with a coffee and a couple of bits of paper and set the pencils to work. I used two different types of paper - one a very smooth piece and the other, the rough side of a piece of water colour paper. Oh reader, please believe me when I say that I wanted to love this very much! The graphite worked quite well; it's soft enough to get light and dark as well as thin and thick from the round core. However, when I switched to the red square core, I had to lean quite heavily to get the marks made on the paper and within a moment or two I snapped the lead (probably my fault for having too much lead exposed, I think). Note: even my little snapped off piece of lead slotted into the lead-holder, so no wastage, even if you snap! The turquoise (on the far left of the terrible photo above) was too pale to be seen properly and the pale green and the gold were actually very similar. I tried laying down the gold and putting the green on top, which resulted in a sort of bluey green, but the colour mixing wasn't too successful for me. 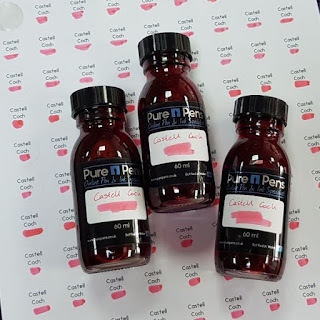 Besides, who's going to be colour mixing when doing calligraphy? I like calligraphy because of the clean lines and flourishes that can be achieved with a lightness of touch. Here the pencil marks are attractive, but not very polished looking. In the hands of a pro calligrapher, I think you could get a nice and unusual effect. Another point to make is that one of the advantages of working with pencil is that you can rub out your mistakes, which you can't do with a pen (well, you can. Some of them. I digress). I tried rubbing out some of the red lettering and it left a distinct trace. The little sharpener works a treat, but sharpen over a bin as suddenly getting graphite fingers from coaxing shavings into the bin as an afterthought makes for messy calligraphy. So, who would enjoy this? I think that, as with most writing tools, a good calligrapher will be able to get a good turn out of this product to get an unusual shaded effect. I also think that children would enjoy using it too because it's FUN. The colours were very pale when on the paper, but that might just be down to my ineptitude with the tool. And I guess that in making a lead hard, to slot into the handset, the amount of pigment must be offset by whatever makes the lead hard? I very much look forward to seeing it in the hands of an expert pen-wielder! Blackwing Pearl Pencil | A Review | A Convert! 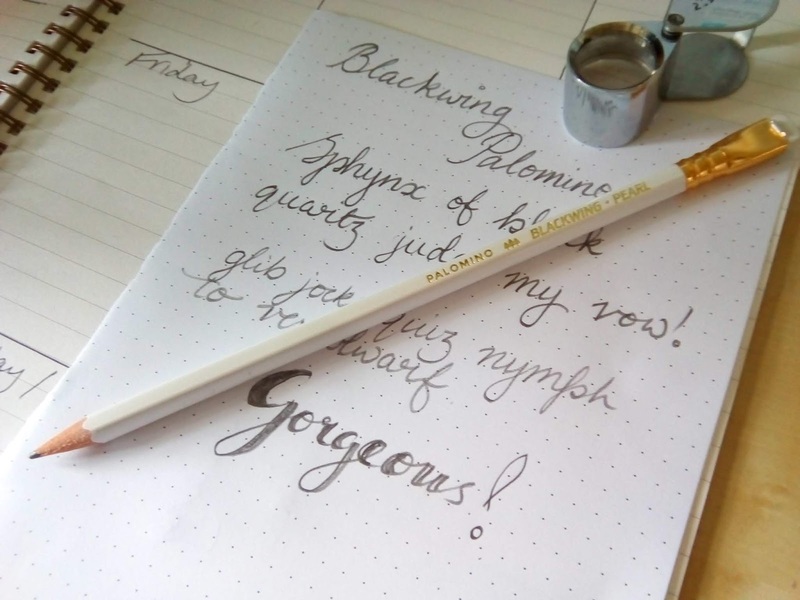 OK - let's get the elephant in the corner out of the way first - I know this is a pencil and not a fountain pen, but I do love pencils and after buying a clutch from Nero's Notes, my friend Scribble sent me a beautiful Palomino Blackwing Pearl.